Half of all employees start a new job engaged, but then their enthusiasm begins to wane. Here's how to reverse that trend. For many employees, the first six months at a new job are the best. After that? Not so much. In fact, workers are typically more engaged during this "honeymoon period" than they will be at any other stage in their employment with a company. Consider pairing new employees with workplace friends to show them the ropes. When Gallup analyzed engagement by employees' length of service, the research showed that though engagement peaks during those first six months, only half (52%) of employees are engaged at this point, while 40% are not engaged, and 8% are actively disengaged. This suggests that there's room for improvement in how companies bring new employees on board. Workers' relatively high engagement levels during the first six months on the job may reflect an initial excitement about being part of a new company -- and that enthusiasm might be strong enough to counteract any early negative impressions. New employees might also feel good about expectations and having opportunities to learn and grow. But new workers also may need support from their manager to form connections or make best friends at work, to believe their opinions count, or to feel their contributions are being recognized. 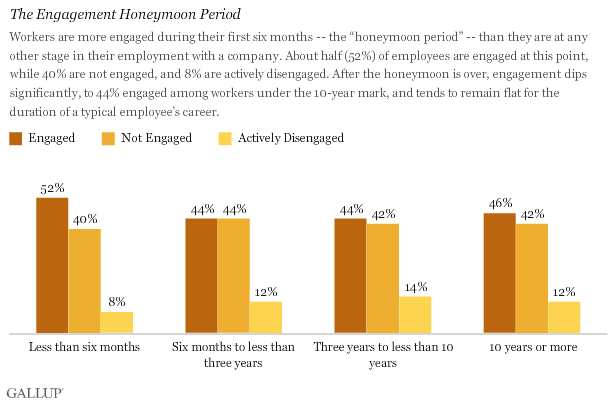 Following the honeymoon period, overall employee engagement dips significantly for workers under the 10-year mark. From there, engagement tends to remain flat for the duration of a typical employee's career. But there are effective strategies companies can use to reverse that trend. They can start building engagement during the honeymoon period, ensure a strong engagement connection from leaders to managers to employees, and actively monitor and manage engagement -- persistently and consistently -- year after year..
Make sure your executive team is highly engaged too. Engagement runs strongest in one direction, and it starts at the top. While overall engagement tends to flat-line after employees' first six months on the job, Gallup has found that companies with highly engaged executive teams tend to see higher employee engagement among those with 10 years or more of tenure. Companies that engage more leaders and managers at every tenure level may hold the key to jump-starting workplace engagement nationwide. Be persistent -- it pays. 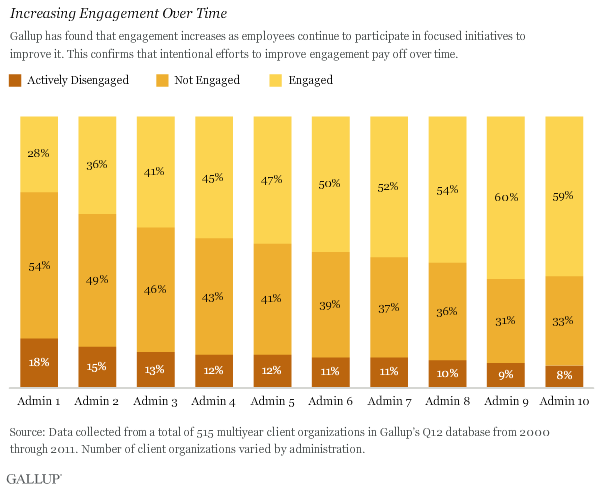 Gallup has found that engagement increases as employees continue to participate in focused initiatives to improve it, regardless of whether a company has been measuring engagement using Gallup's Q12 employee engagement survey for a few years or for many. This confirms that intentional efforts to improve engagement pay off over time. Focusing on employee engagement from the start, pairing engaged employees with engaged leaders and managers, and managing and measuring engagement consistently are a company's best weapons against lagging engagement over the course of employees' careers. Clients that continuously administer the Q12 survey and make improvements based on their survey results can increase engagement every year at all tenure levels. This is particularly true for employees who have been with the company 10 years or longer. By following this strategy, engagement can last beyond -- years beyond -- the first six months on the job.